Los Angeles city skyline at dusk. The IT edit of handy hints to help your Los Angeles adventure be the best it can be. All year round is perfect for visiting Los Angeles given its weather, although February is probably the wettest month and December the coldest. 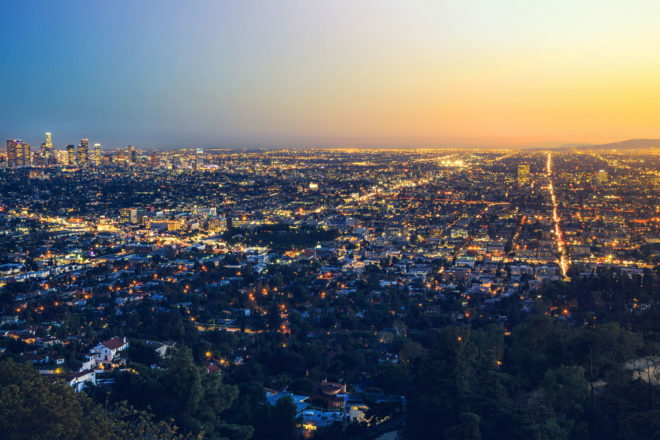 Los Angeles is quite spread out so, if you are looking to tick off a lot of suburbs in the one visit, you might want to consider hiring a car. Most hotels have garaging for a price and the roads are not as scary as you might have heard. Hollywood Boulevard and the Sunset Strip are the epicentre of Hollywood, both flashy and trashy, so keep your wits about you when here. There are still neighbourhoods and suburbs in Los Angeles that are, if not entirely no-go areas, best left to the locals. Make sure you have a good map on you and do some research before you arrive.